Melanie Manchot, The Ladies (Wren Library), 2017 digital chromagenic print. Courtesy the artist, Parafin, London and Kettle’s Yard. 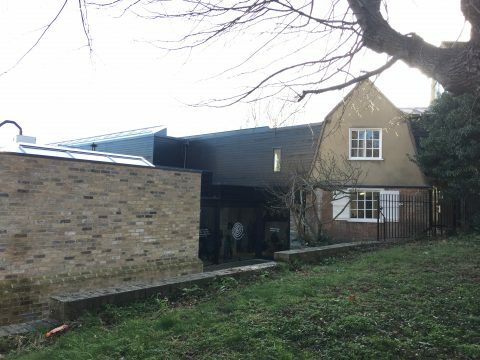 Kettle’s Yard, a renowned international art hub and gallery in the centre of Cambridge, reopens this month after an ambitious two year development. Jamie Fobert Architects has realised this latest expansion which layers onto the vision of Sir Leslie Martin and David Owers’, creators of a bold 1970s gallery extension to the four modest 19th century cottages. These were bought by Jim Ede in the 1950s to house his very personal collection. 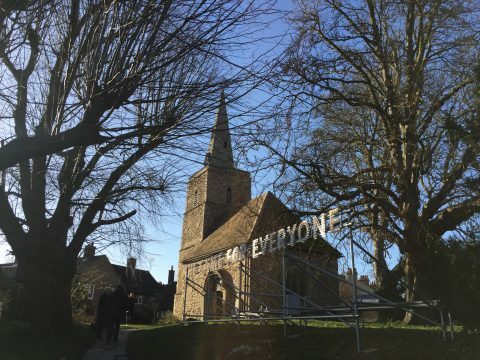 The 21st century extension began to take shape back in 2004, under the direction of Andrew Nairne, who joined Kettle’s Yard as director in 2011. This final chapter includes new exhibition galleries, a research space, the Clore Learning Studio, a cafe, and a redesigned foyer. The new galleries contrast starkly against the original domestic and subtly curated Ede home, originally opened to visitors by the couple in 1957. The new spaces harness an international ‘white cube’ architecture, with concrete floors and clean white walls, which for some critics in this era of architect statement buildings, is predictable. Director Andrew Nairne is unapologetic about this stance. Putting art and artists to the fore, he was keen to avoid a showy building and commissioned one that would act merely as an open stage. 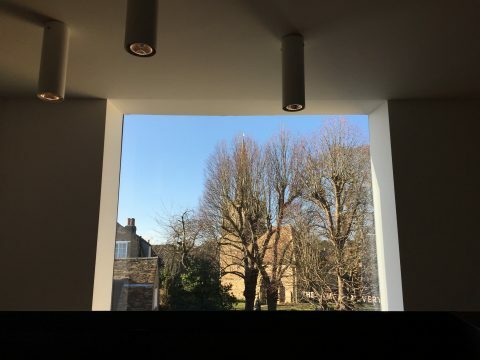 Within that contemporary space there are some gentle visual clues that connect the old ‘house’ with the new ‘gallery’ such as the new information desk, a crafty nod to the oak dining table of the house, and the gallery rooflights which resemble those designed by Martin and Owers. I interviewed Andrew Nairne about his thoughts on the new development. For ten years, until 1966 when the house was sold to the University of Cambridge, every afternoon was open house. 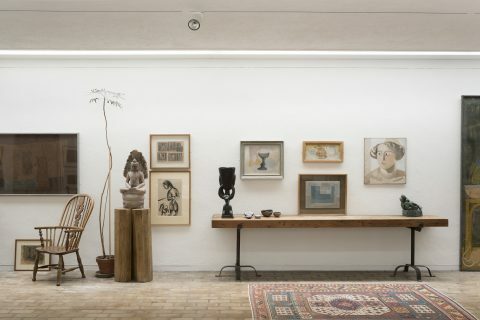 This was the golden time when Jim and Helen Ede welcomed students and passing visitors, showing Jim’s extensive art collection to an increasingly wider public. 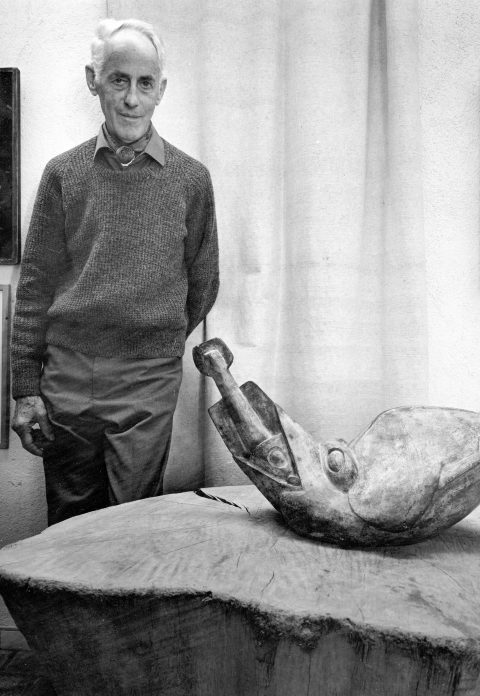 The collection includes works by now well known artists, particularly from the St Ives group, including Alfred Wallis, Barbara Hepworth, Joan Miró, Henry Moore, Henri Gaudier-Brzreska. As well as now being an important international collection, it forms a diary of Jim Ede’s personal connections and friendships with artists. Like a shrine to his passion, art in the house still mingles with cups, saucers, chairs, rugs, pebbles and other items, all still meticulously placed according to Jim Ede’s direction. Visitors must still ring the doorbell, a reminder of the original welcome by this art-loving couple, though the recently introduced timed tickets belong to a less personal era. Andrew Nairne gave me a tour of the house. The opening exhibition, Actions. The image of the world can be different, features 38 international artists and runs till 6 May 2018. It takes inspiration from a letter written by the Russian sculptor Naum Gabo (a friend of Jim Ede) to Herbert Read in 1944 which muses on the role of art and its influence in the world. Nine newly commissioned works are the highlights of the show. Among them is Rana Begum‘s No.764 Baskets, spotlighting religion and humanity coming together in a cascading cocoon of bamboo baskets. The new research space is filled with the warmth of Callum Innes‘ newly commissioned watercolours. 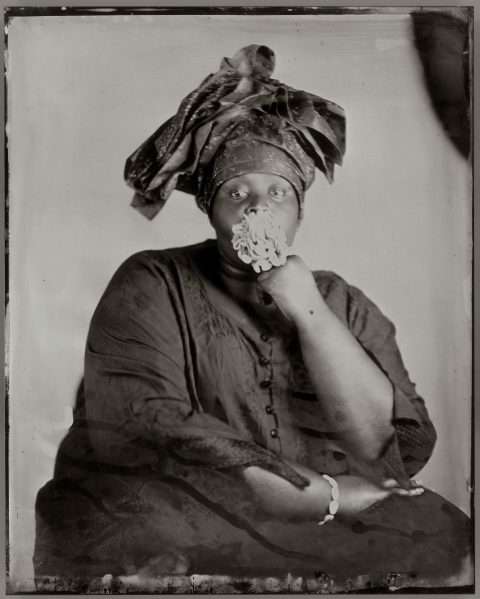 A series of six tintype photograph’s show artist Khadija Saye taking part in Gambian healing rituals. Her contribution to the exhibition was agreed before she tragically died in the Grenfell Tower fire. Khadija Saye, Peitaw, 2017. From the series: Dwelling: in this space we breathe. Photograph, wet plate collodion tintype on metal. Courtesy the Estate of Khadija Saye and Kettle’s Yard. Throughout, the undercurrent is political but there is also a strong sense that Nairne and the gallery curator have selected favourite artists who connect in some way to people’s own lives very directly. With that, they have created a credible link between the old and new space. 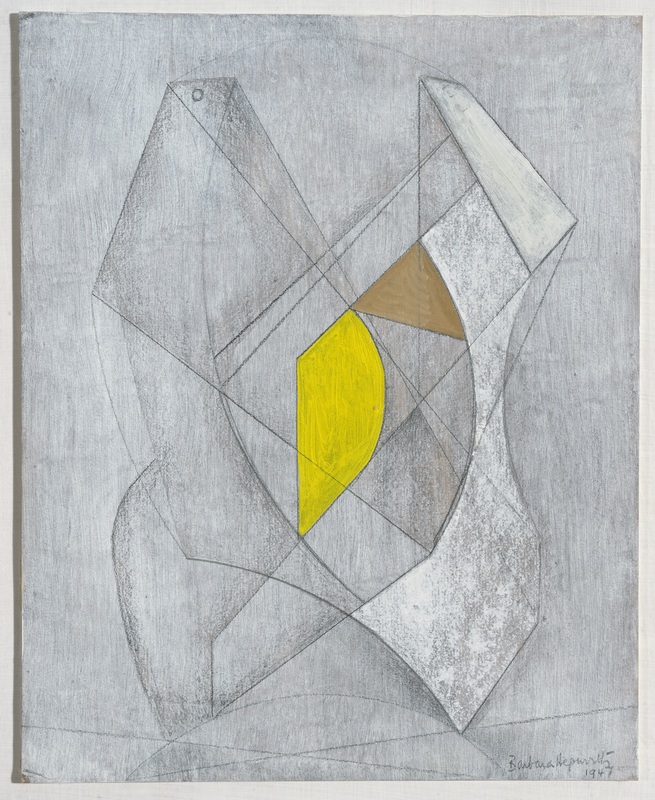 Barbara Hepworth, Two Figures, Yellow and Brown, 1947. Oil and graphite on hardboard. Courtesy Kettle’s Yard. Andrew Nairne gave me a tour of the new gallery spaces and we had a close look at the works of Melanie Manchot, Khadija Saye, Barbara Hepworth, and Richard Long. Andrew Nairne highlights the importance of images to create alternative and imagined images of the future. He describes the exhibition as deliberately curated for both an art audience and more importantly, for local people – offering diverse views and images of others: something we can all relate and get close to. Actions. The Image of the world can be different is on until the 6th of May. How people from other countries deal with the ‘dreadful’ snow in the UK?